Once upon a time, my very best friend in the universe moved to our little town (I didn’t know she was going to wind up being my very best friend yet) and on our first “date,” we went to a local sushi restaurant where we shared an embarrassingly difficult-to-eat sushi dish (followed by a trip to our weird mall where we almost got foot massages, but that’s another story.) In the time that she lived here, we went back to that restaurant countless times where we honed our menu choices (read: we never ordered the volcano roll again), and part of our tradition was getting the garden salad with the miso ginger salad dressing. It’s nothing new–it’s a staple of sushi bars and Japanese restaurants pretty much everywhere. But. 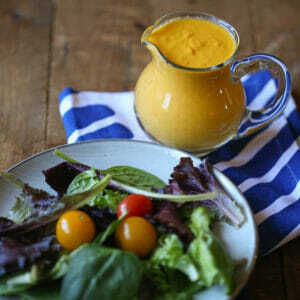 Their miso ginger salad dressing was the best I’ve ever had. And then she moved and the sushi place was closed for health code violations and I entered a really dark time because, I mean, if she wasn’t there, at least I could go eat my Steve Roll and miso soup and garden salad by myself and pretend she was. But I didn’t even have that. 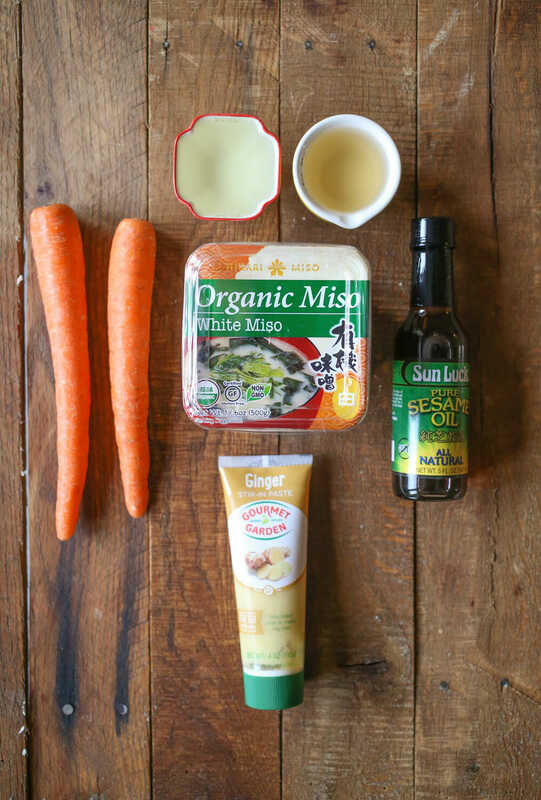 And I knew I could never recreate my favorite sushi, but I was positive the salad dressing was out there. Here you go. Courtesy of The New York Times and Mark Bittman (with a tweak or two). 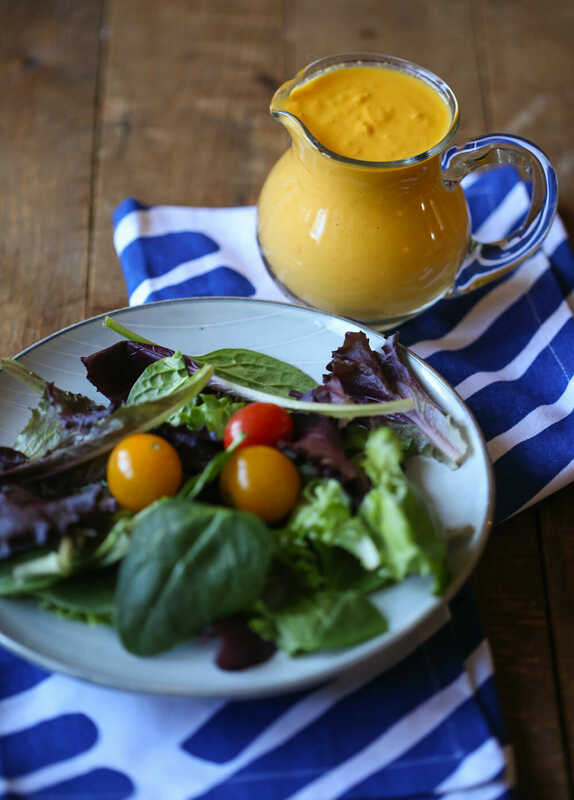 If you have ever found yourself in a similar position of loss (or, really, if you haven’t and you don’t want to go out every time you get a hankering for this salad dressing), we’ve got you. You’ll need a couple of carrots, some rice wine vinegar, a neutral oil (I know it’s not cool to use oil like peanut oil, but, really, you want something that doesn’t have a distinct flavor), fresh ginger (my grocery store was out, so I snagged a tube of the fresh stuff in the produce section), sesame oil, and white miso. I had a hard time finding white miso in my little southern town. And when I say “hard time,” I mean I tried every grocery store and a couple of shady Asian groceries (that, by the way, were all closed in the middle of the day) and wound up at a store I never shop at unless I absolutely can’t find what I’m looking for anywhere else and didn’t find white miso but I did find a two-pound roll of Amish butter and ordered the white miso from Amazon. 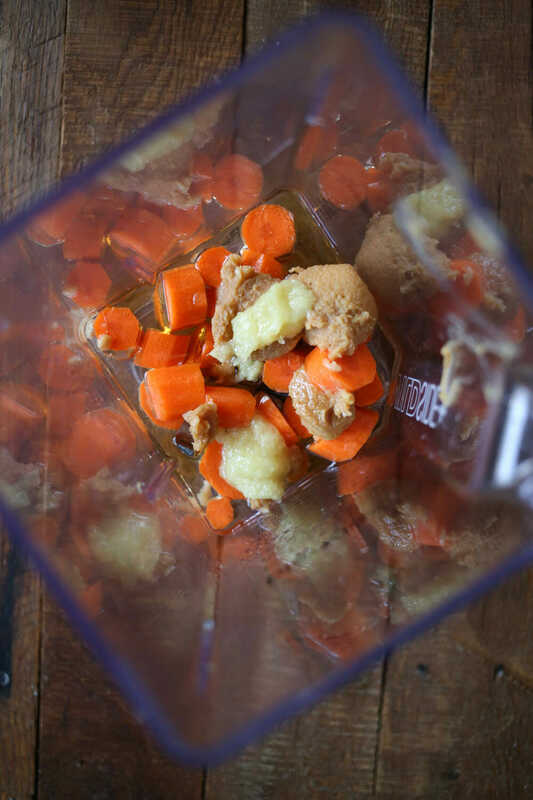 If you end up buying it and need other ways to use it up, try this delicious recipe from Sara! Y’all. I’m in a weird grocery store…like the grocery store of last resorts, where I go when I’ve tried to find something in all the other places and have failed. But then I saw this. I’ve never seen or heard of this before, but I feel like I need it. I mean….it’s a giant roll of #butter. Which I bought. I still haven’t tried it, but according to my Instagram crowd, I made the right choice by welcoming the roll of butter into my home. Anyway. 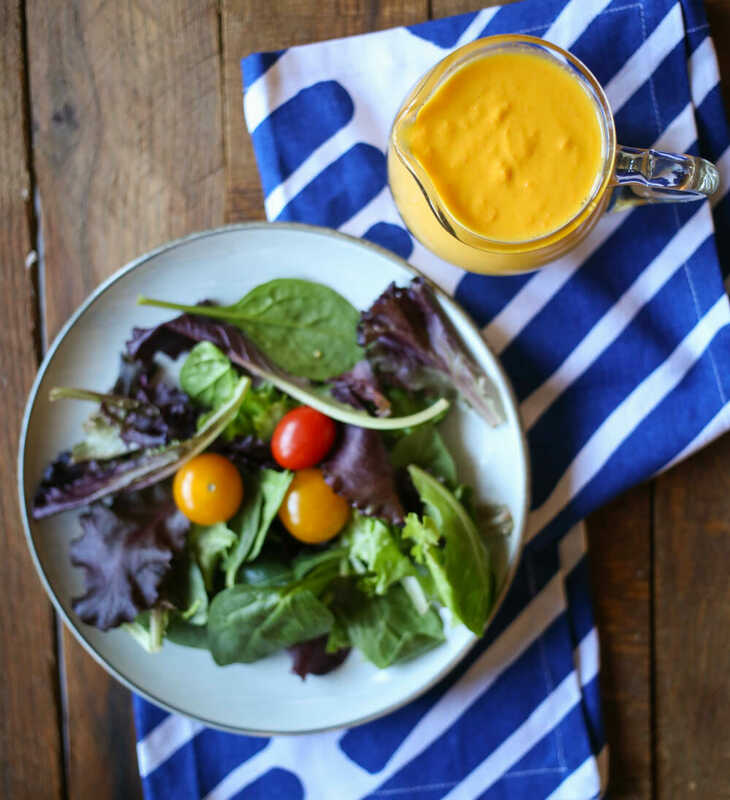 Salad dressing…we’re talking about salad dressing. 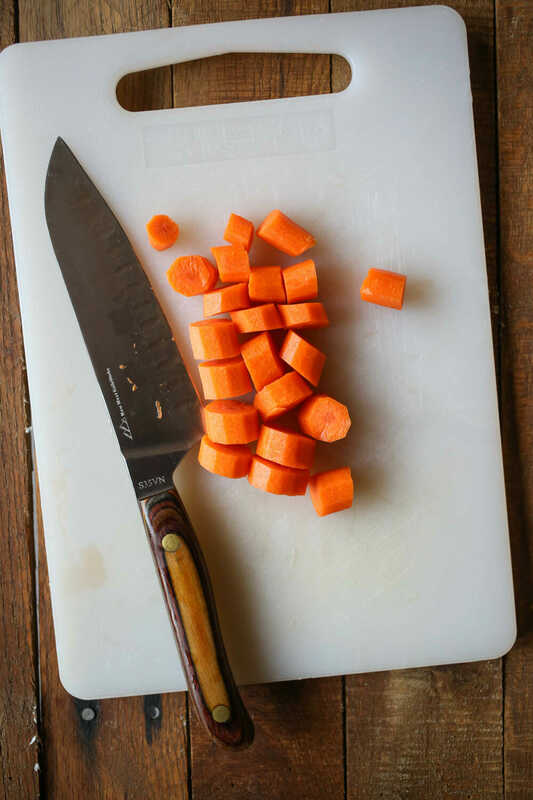 Peel and roughly chop the carrots. and blend until smooth. Season with salt and pepper to taste. You also may want to add a little water if you prefer a thinner salad dressing. Serve on top of baby greens or use as a marinade for fish or chicken. Place all ingredients except water, salt, and pepper in the jar of your blender and blend until smooth. Season with salt and pepper to taste. If desired, you can thin out the consistency a little by adding 1-2 tablespoons of water. So excited to try this. I happen to have yellow miso on hand, so I’m going to try it with that. 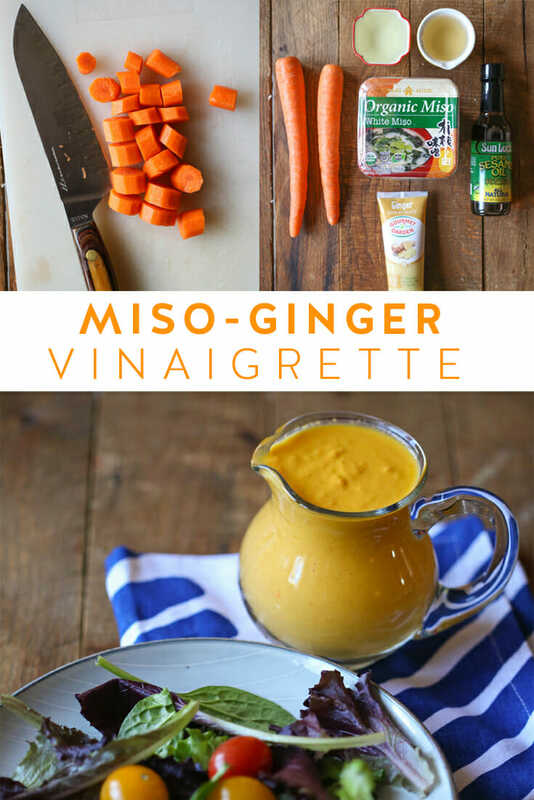 I love a good ginger-miso salad! Thanks. Yum! I wish I was having this for lunch today! Wait – this may be similar to the dressing in the Super Spinach Salad from Trader Joe’s (the best salad btw!). And now I can make the dressing at home? Awesome! Kate! I’ve never met you, but I love you for always giving me a good chuckle. You crack me up! Good luck with those rolls of butter! Ok, so you probably can’t say, but was the restaurant called Sake Sushi? If so, we had one for about a year in the town next to us and- SERIOUSLY!- best miso dressing ever. I’m so sad they mysteriously closed down here, too. I loved the Steve 2 roll and my husband cries giant tears over not being able to get the Pip Boy roll. Thanks for the recipe! I don’t do Sushi. However, I love the Benihana’s Miso Ginger salad dressing. If this is better, I can’t wait to try it.